Up front notice: I love Starbucks. Loved it for years. When I traveled frequently for work, I would look forward to grabbing a Mocha or Vanilla Latte anywhere I happened upon a Starbucks store. When I saw a Starbucks drive-thru while on vacation in California several years ago, I was jealous that New Jersey wasn't the chosen state to pilot this concept (we have since been brought into the fold). I love the whole concept of Starbucks, and if they were based here, I would want to work for them. However, when they recently introduced their new instant coffee, I thought, "whoa, these people have lost it." Since their inception, they have preached (and I have worshipped) at the altar of "only freshly ground, fresh-brewed, barista-made" coffee. 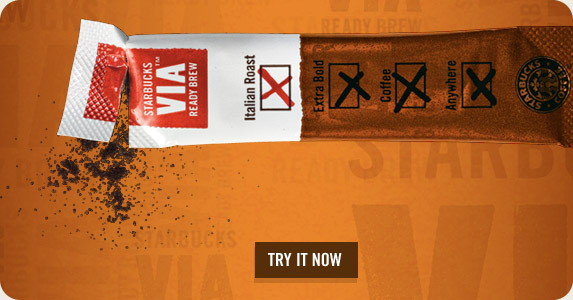 So I really paid little heed to the onslaught of advertising that has been launched for Via, their "ready brew" instant. Then, one day, two slim, attractive sample packets appeared in my kitchen. And yesterday, after finishing our normal daily pot of French press coffee (from my favorite vendor, Counter Culture, in North Carolina) and not wanting to make another whole pot, I thought "...hmmm, maybe I should give one of these little packets a whirl." Tear the packet, pour contents into cup, add boiling water, stir. After adding the requisite half-n-half, I tentatively took a sip, and then another. I could not believe how good this was. According to the web site, there are three varieties of Via: Columbia, Italian Roast, and Decaf Italian Roast. I sampled the Columbia, and I've gotta tell you, this was a pretty darn good cup of coffee. Now, will it replace my French press morning ritual? I don't think so. But when I just want one cup of coffee, pronto, Via is the "way" to go. Check it out.